My first impression of the Bar Crusher was a solidly-built boat with a well thought-out fishing platform, which drew me in for a closer inspection. It was then I discovered the practical, well-engineered and easy-folding hard cover and windscreen that meant I could store the 575C in my low clearance garage. The Bar Crusher was over my budget that I had allowed for, but after the test drive I had to have one. I live in Adelaide and normally fish local waters but recently had the opportunity to follow a friend out to a ground off Pt Broughton on the Yorke Peninsula. We left the ramp at around 6am and navigated the 7km channel until we hit open water and 1.5m seas, not the best conditions considering we had around 30km ahead of us making it my furthest offshore trip to date. Not only did the 575C eat up the conditions but it offered a soft stable safe ride, unlike various other boats I have been in which require you to see the local chiropractor after each run due to the constant pounding. When we arrived at the ground we had a number of boats around us and we were just as stable as anyone else at anchor thanks to the ballast system. The high sides make it easy to keep your balance in rough conditions and wide gunwales make a good seat during calmer weather. 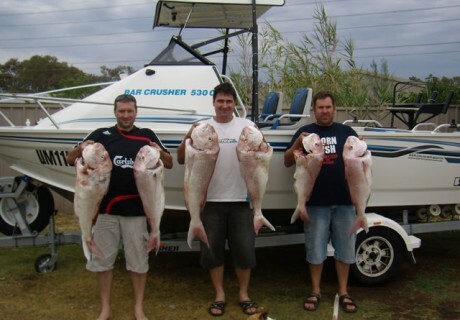 By the end of the day we managed six snapper over 60cm which we were able to tuck out of the way in the under floor kill tank. Overall the Bar Crusher is the complete package with the perfect blend of a smooth ride and stability at rest. The quick change from bait board to ski pole makes the Bar Crusher family friendly for those fun trips up the river. One thing you don’t find too often these days is good after sales service. Through my own fault I managed to break off one of the windscreen handles on the top of the roller door, due to not winding down the jockey wheel. I contacted the guys at Bar Crusher and they not only sent out a new handle within the week they also supplied a spare in case it happened again.